The Plymouth Citybus Paint shop is in full swing at the moment with new repaints hitting the road faster than they have for a long time. 519 is the latest in full swoops, being the first double decker with the Every Journey Taken Care of branding. 482 was working the 50/50A/51 today and I noticed at the left hand corner of the rear bumper was missing. Also, 370 and 371 were working the 35/35A/61/62, 252 was working the 07:41 61 from transit way and the 35A after before changing to the 12A to go to Down gate and 250 has been working the 40/41/44 all day. I also caught 108,106 and 144 on the 42A/42B/42C and 94 on the 42. I guess 7 blue volvos are being replaced by on 7 (or maybe 8) red deckers with the rest of the 501-519 batch going swoops. Are 517 & 518 being swooped with 519? Which deckers are staying redflash for new 42? 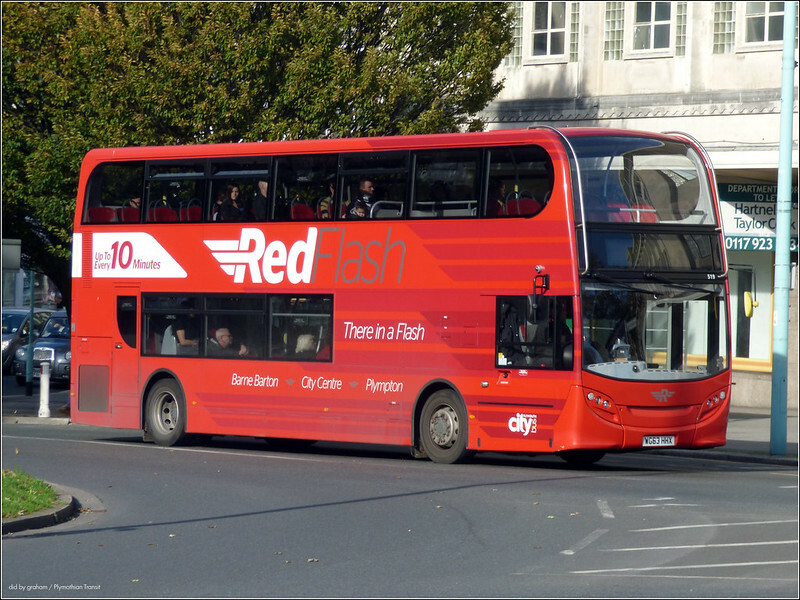 So presumably there are too many Red Flash branded E400s for the rumoured transfer to the 40/1/2??? What will the fleet number be and what do you mean by spark branding? What will the fleet numbers be? Graham, what is meant by WA17FSU having a spark branding added and is a definite decision made on the fleet number? Target travel have acquired 3 51 plate double deckers. Not many withdrawn vehicles left at Milehouse now. On Saturday 16th June in the lower yard behind the tramshed Darts 43, 45, 47, 48 and 203 were parked. In the raised depot the shell of 205 still lingered on. Also parked in the lower yard were preserved Dart 27 and possibly withdrawn mini Dart 202. Saw the back end of the E400 City in the paint shed today, with its 'spark' livery. Also has 'every journey taken care of' on the rear bonnet. Only got a slight glimpse as driving passed, doesn't seem a particularly mind blowing livery... hope to be proved wrong then they got the streets! It looks like PCB's service changes are pencilled in for 30th July. I would expect a high-profile launch for the new "Spark" buses, especially given that the 21/21a is apparently one of Go-Ahead's best-performing bus routes outside of London. And of course the ADL Enviro400 City is a stunning design in its own right - it took its inspiration from London's New Routemaster and was and was really intended for the London market, but the big surprise has been its enthusiastic take-up by non-London operators looking for something more stand-out and special for their more high-profile routes. 135 out in green flash livery on the 5A from saltash to staddiscombe on 24/6/17.